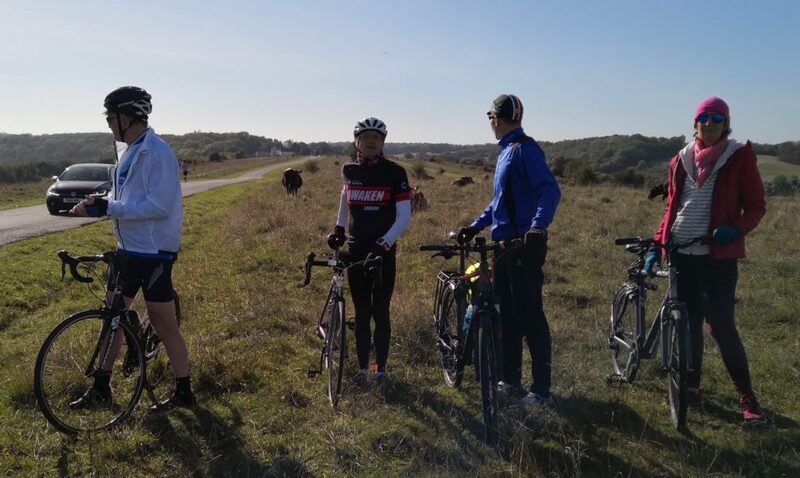 Its a long time since we’ve done a ride report! Although still doing regular Rides finding the time to record them is a problem! Perfect day for riding. We headed out of Coulsdon straight up the lovely Farthing Down, bid a brief hello to the resident cows there, and then off down, passing Chaldon Church and then Over the B road for the first proper descent, flying down Hilltop Lane, taking the two bends at a swoop, easy to hold your speed with, unusually, no cars heading up to worry about. Emerging from under the M25,instead of turning left to head straight to Bletchingly, we turned right. Part of my plan to restructure the Two Counties Ride to avoid the nasty south to north climb up Tilburstow Hill, which, over the last ten years has become busy with close passing fast motor traffic. Climbing a hill is tough enough without the added stress of constantly being buzzed by fast moving cars and lorries. So we headed a bit further west than usual, skirting the suburbs of the Redhill Reigate conurbation. We could have used the NCN 21 link across Nutfield Marsh, through the country Park, but I couldn’t remember what the surface was like. The NCN varies between perfectly rideable on 23’s to absolutely nightmarish on anything less than mtb knobblies and I couldn’t recall where this little shortcut was on that spectrum. So played safe and stuck to a longer detour on the road. A road, which in places, was probably in a worse condition than the NCN! And as we passed where the shortcut emerges, I could see it would have been fine! On southwards, through Nutfield, to Smallfield where we turned to the east along even quieter lanes now, despite the warming sun, feeling increasingly autumnal, a patchwork of yellow, brown, orange and red fallen leaves patterning the road under our rolling wheels. 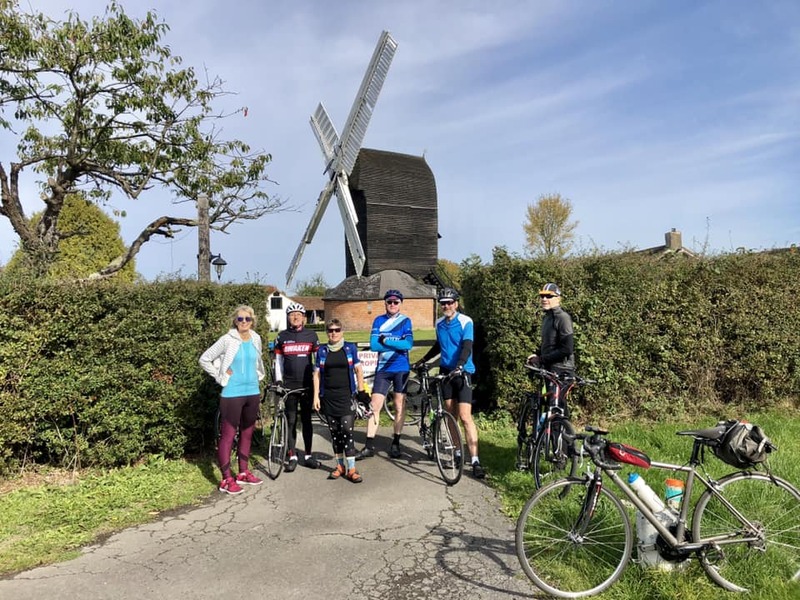 At Outwood, we stopped by the windmill, just as another two riders who had been chasing us from Coulsdon caught up, having nipped through one of the earlier lanes that links the Nutfield Smallfield road to Outwood. Lovely obligatory windmill photoshoot then off south Down Outwood Lane for a change to Bletchingly. We ignored the road closed signs. Usually not a problem for bikes. Not quite problem free this time though! The road was almost completely blocked for quite a few yards about a mile down. Lots of heavy machinery, metal fences. Someone obviously didn’t want anyone coming down here. But the biggest problem for us was a thick patch of the stickiest mud I’ve ever come across. Too late I realised how horrid it was, or I would have warned everyone to carry their bikes through. How I envied Trevor his disc brakes at this point as my rims clogged up with thick clay jamming the brake arms and completely burying the pads. Those with road shoes and cleats had even more problems. Another reason why I have never made the move from toe clips to clipless. If for any reason you have to dismount and walk, firstly that can be a problem in itself depending on your cleat choice, and then the slightest bit of dirt and muck can interfere with the clipping system. We had to search out suitable twigs and spent a good few minutes removing the mess from our bikes and shoes. Then we were back on the road. The upside of this episode was that the closure had rendered this road car free. We rolled along chatting, side by side, relaxed, enjoying the sun and the views of the Surrey countryside. Lovely. Brief stop in Bletchingly to refuel. Watched a couple of clubs roll through, fast, chaingang style up the horrid drag of the A25. Some irritated drivers behind, who didn’t seem to realise that in that tight formation they were a lot easier to pass once the oncoming lane was clear, than if they’d been strung out single file. However, there is a reason our routes out here don’t use the big A roads. They are fast, busy with motor traffic, even on a Sunday, often climb uphill. I can’t think of anything less fun than trying to keep up with a fast group on these horrid roads. Indeed, we witnessed a couple of riders who’d obviously been dropped, falling further back as the the main group steamed up the hill. I hoped they’d wait for those people further on. We headed down that same road just for a few yards before turning off, to head towards the viewpoint on Tilburstow Hill. A much easier climb from this direction. Then off down The Enterdent, a particular favourite of mine, narrow bumpy little descent through the trees. After that, a little climb through the charming hamlet of Churchtown. This little place seems to transport you back in time. Feels a million miles and a couple of centuries away from London. From here it’s not far to the beginning of the infamous Gangers Hill climb. However, on this occasion, we decided to turn off before the big push of it, to head down the NCN through Woldingham school. A lovely rolling ride through a wide valley, which never disappoints and Is especially beautiful on a lovely day with the tree lined slopes beginning to show hints of autumn colours glowing through the fading summer greens. The downside of this route back to London, is that you have to climb back out of this lovely valley. I’d chosen Halliloo Valley Rd. It’s a terrific descent when riding south. Not such a great climb in the other direction. It’s very tough at the end with a nasty kick up. But it’s the motor traffic that really makes it tough. But we all managed it, and then headed off the main road on to the country lanes leading to Fickleshole and our feed stop, The White Bear. Which was extremely welcome, and so warm that we could sit outside. After that, it’s all downhill! We flew down Layhams, turning off down Nash Lane and then on to Gates Green Rd. Once in West Wickham, riders began to peel off, calling goodbye, until, I waved my last companion off just south of Bromley. I headed to Shortlands and then back through Beckenham Place Park . Which counts as arriving back in Lewisham. A great ride, despite the muddy deluge and the nasty Halliloo climb, for which I apologise and will try to make sure don’t happen again.